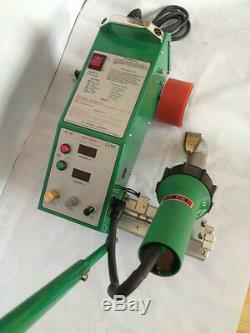 220V Intelligent flex banner welding machine / Flex Banner Seam Welding Machine /flex banner welding machine. ONLY FOR 220V AC , IF YOU USE 110V , PLS USE 110V To 220V. 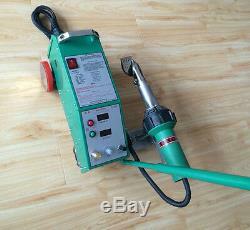 220V Intelligent PVC Flex Banner Seam Welding Machine with Leister Heat gun. Intelligent flex banner welding machine. U small size, light weight and easy to carry u Digital display function u Adjustable wind speed u Faster welding speed u No fold during welding u Having universal wheels and handrail,, move machine easily u Laser positioning line u LED light, more convenient work in night 1. 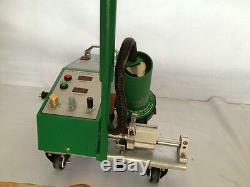 This equipment is designed for weld PE, PVC, tent, tarpaulin and other pvc material without glue. To help you know the performance for welder and how to safely use, maintenance etc, and play full to the function, we made the manual for your reference. Please read manual carefully before using machine, and keep it well 2. Warning: when using this equipment, please follow the basic safety protection, avoid the danger of fire and electric shock damage of person, also need to pay attention to the following items, before starting, be sure to read. Keep the work place clear, messy work place will bring unnecessary trouble. Choose working environment carefully, can not be used in wet ground machine, light conditions must be good 4. Please make sure that the ground wire is connected before start. Please turn off the power. When machine maintenance or replacement components 6. For safety and the long life of the machine, please do not let the machine operates overtime. If any special incidents happened, please stop the machine first for repairing, And do not deal with the special incident with improper procedures. 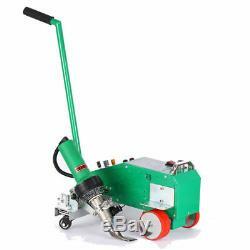 If the machine is operated on land, keep the work place clean and no dust there. If dust or something blocks the inhaling filter of heater, the heating wind can not come cut adequately and then temperature inside of filter will rise to let the heater burn down. Moving, Dismantlement, Installation, Cleaning: 1. Please check if there is damage or missed parts after unpack the machine. The place for installation must be flat and the floor is strong enough to support the machine and moreover, the installation place should close to power supply. Keep the installation place no dust and avoiding sunshine. Please sweep away the anti-rust oil from the machine with detergent and re-lubricate with light lubricating oil after installation. 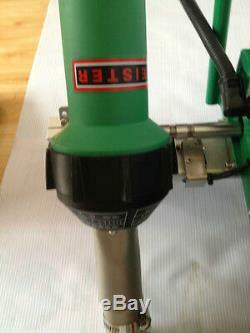 Use LISITER brand heating system imported from swissland and digital function for temperature showing. Nowadays, we add more new functions, such as laser guiding unit and portable walking unit for choice. Application of Banner Welder Welding and joining separate pieces made of some hot melting materials, such as PVC fabric, outdoor poster banner, textilene, plastic pieces, and so on. 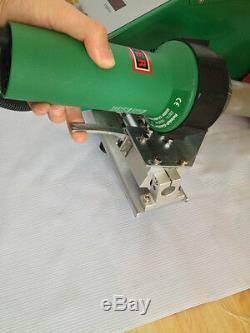 It is also used to laminate and hem the margin in edge-works of the pieces. Advantage of welding machine 1. Well seam & weld the gap of the heat-melting material, such as PVC&PE material, fabric, canvas, sail cloth, without glue. Small in volume, portable and light, conveniently transport. Automatically self-moving, adjustable speed as your requirements. Assembled with high quality accessories. Constructed simply, easy to maintain 8. Easy and comfortable operation, proper packs for transport, quake-proof package. 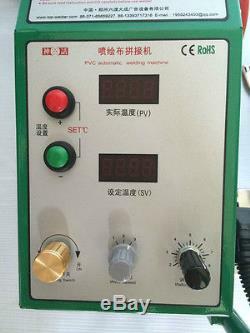 Digital display for controlling temperature and speed. Just need the family power for starting the machine. Output: AC 220-240V, 3000 Watts. Output to your electricity appliance: AC 220V -240V 3000W. For using UK, Europe, Asia (220/240V) appliances in Canada/USA and other overseas countries with 110-120V voltage standard. For Both Electrical & Electronic Appliances up to 3000W. For example, you can use appliances of UK, Europe, Asia electricity standard (with 220/240V); like Power hand drill , sewing machine, blender, computer, printer, coffee maker, mixer, Stereo system, vacuum & refrigerator, video game & console, TV/DVD/VCR etc in Canada/USA or any country with a supply of 110/120V electricity standard. 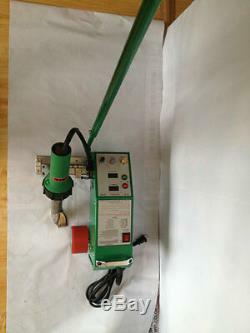 1 x 220V welding machine with Leister Heat gun. Unused/unopened merchandise will be fully credited. All emails will be answered within 24 hours. 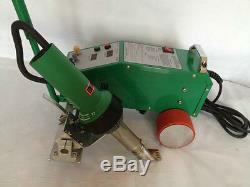 The item "220V Leister Gun 1600W Intelligent PVC Flex Banner Seam Welder Welding Machine" is in sale since Tuesday, November 13, 2018. This item is in the category "Business & Industrial\CNC, Metalworking & Manufacturing\Welding & Soldering Equipment\Welding\Welders, Cutters & Torches\TIG Welders". 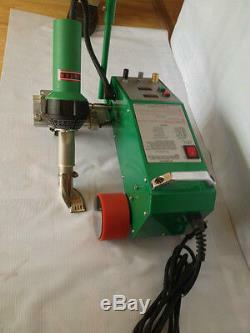 The seller is "cnc_tool" and is located in Shenzhen ,guangdong. This item can be shipped worldwide.